1) (This is the most important thing to remember!) Find a family member or friend who has a Gold Card Pass and wants to use their "get someone in free" ticket. 4) Don't eat. In our case, we ate lunch in the park: a decent salad. The chicken in it wasn't of the best quality, but the rest was pretty good. I bought my sister's lunch, and the total was around $18. 5) Don't buy anything. We went into the little shops and looked at some things, but didn't buy anything. I hadn't been to this park in a long, long time. We didn't ride any of the rides, but we did go on the steam train that was used during WWII in Alaska to transport troops and lumber. The park has 2 engines (both were used in Ak. during WWII): Klondike Katie and Cinderella. When the train is in the station, the area is covered in the steam. Not a pretty sight! There is an operating Grist Mill on the grounds. It was built exactly as it would have been in the 1880s and the first fully operating grist mill built in Tennessee in more than 100 years. What does it mean to build a structure as it would have been 100 years ago? It meant that the roof shingles were split by hand, and all the door hardware was created onsite by the park’s blacksmiths. The structure’s round logs were hewed by hand in front of the building site with holes drilled in the logs by hand using different size augers. The architectural shingles on the side of the building and all lumber were milled at the park’s sawmill which was then located in Craftsman’s Valley. The window panes were made by the park’s glassblowers, and each window frame was made onsite using steam engine power to operate the five-in-one machine which is now located in the Valley Carriage Works wagon shop. All work on the grist mill was done by then Silver Dollar City employees during the park’s operating season so that park guests could observe the process. It took six months to complete the mill, just in time for the annual fall crafts festival. The Dollywood Grist Mill is a complete and fully operating mill where corn and wheat are ground into flour daily. Both are available for purchase by park guests, along with a variety of other goodies including the popular cinnamon bread. The cinnamon bread was excellent! My sister bought some for us to share, so there's another money saver for you! There's also a chapel on the grounds. I couldn't find any information on the building, except that it was named after the doctor who delivered Dolly (as in Parton). Old organ that was donated. It sits on the altar. Standing in front of the altar looking toward the door. 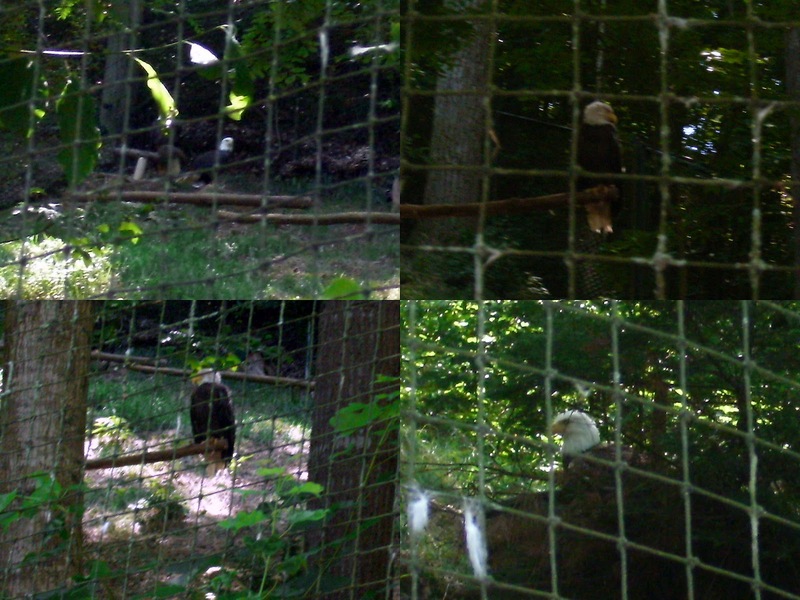 There is also an American Eagle Sanctuary in the park. Established in 1985, the not-for-profit American Eagle Foundation is headquartered at Dollywood. The organization is widely recognized as a national non-governmental leader in bald eagle conservation, recovery and public environmental education. 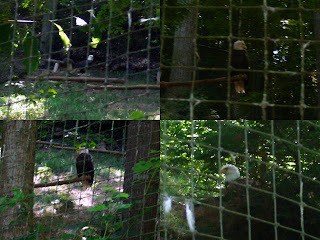 The federal and state licensed organization operates the world's largest bald eagle exhibit and breeding facility where many of its resident non-releasable eagles have successfully reproduced in captivity and released into the wild. I had no idea these birds are as big as they are. It was magnificent to see them on the side of the mountain. I'm not sure just how many rides are in the park. It didn't seem like there are very many, but we didn't go searching out the rides; in fact, we stayed away from them. We went by the carousel; who doesn't like a good carousel? There's a new ride this year: The Wild Eagle: the first "winged" coaster in the USA. YS has ridden it several times. Me? I'll ride a coaster as long as my feet are on a platform. Don't even try to get me to ride one when the feet dangle. No thank you. This is a picture of the incline during the ride. My sister & I were in agreement that just that part would do us in. Right before we left, we got to go through Dolly's old tour bus. The guide said that Dolly had 2 rules on her bus: she always did the cooking, and she doesn't do dishes. The park has an arts & crafts festival in the fall, and the lights at Christmas are spectacular. We went a long time ago. I may have to get a pass so I can go back for a couple more visits. On second thought, maybe I didn't do the park for $20 or less! I've been to Dollywood once and hope to go back someday. I loved it! Enjoyed all your pictures. So fun! (Though I LOVE the rides - all of 'em, especially ones where my feet dangle and I can't wear my flip-flops b/c they'll fly off :)). I've been to Dollywood, too. Very nice park. I have heard that Dolly is always very nice when she is in the park to greet the guests. I also have known people who worked there and they said that she was very good to her employees. She sounds like a lovely person. I've never been in the park when it was Dollywood but back in college we went and it was Silver Dollar City then. I'd kind of like to see it now. Sounds like fun. I wouldn't get on the coaster either. I've never been to Dollywood, although we talk about making it a stop on the way to/from Hilton Head some day. Hard to believe you did that for $20. You must have great will power! Looks like you had a great day. I have always wanted to visit Dollywood...sure sounds like a fun time to me! I LOVE cha- ching moments! Sounds like a really fun day!! And I always spend a fortune on these places, lol! Between the yummy snacks and treats for The Bella, we're done for!